APR 04 14 – 1:05 AM – Ottawa’s own Norm Aitken, 32, chef and partner at Juniper Kitchen & Wine Bar in Westboro, did the nation’s capital proud last night as he took the top $10,000 prize on Chopped Canada, beating three rival chefs in the first episode of the second season. While Food Network programming may not exactly be brain food – it’s entertainment, after all — social media including Twitter immediately erupted with enthusiastic congratulations for the strong showing of one of Ottawa’s own, the moment the show was over. 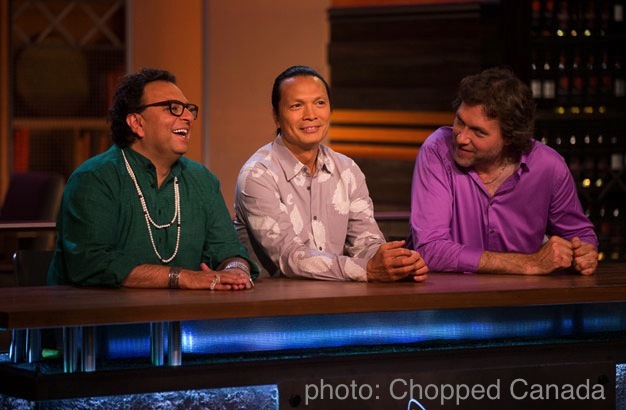 Photo right, L-R Chopped Canada judges and chefs Vikram Vij, Susur Lee, Michael Smith. Host of the reality TV series is Dean McDermott. And what better way to celebrate than with 50 well-wishers and friends, invited to the 110-seat restaurant for drinks and nibbles last night while Chopped Canada flickered on a big-screen TV in the background. 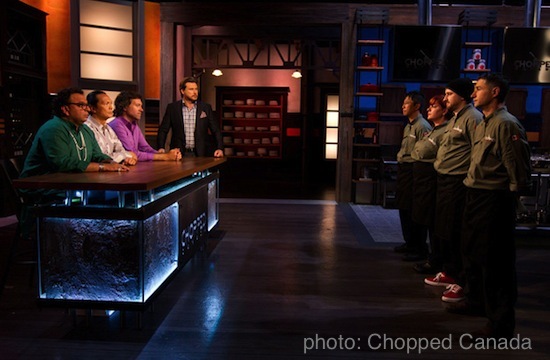 Recall that each episode pits four chefs against the clock – and each other – for a chance to win some impressive coin. Last night’s rotating panel of judges included celebrity chefs Susur Lee, Michael Smith and Vikram Vij. – Justin Myles, 28, head chef and co-owner of Iron Skillet Custom Catering in Kearney, Ont., north of Hunstville, with over six years of experience. Other chefs from the Ottawa area scheduled to appear in future Chopped Canada episodes are Derek Pennell, 29, of Carleton Place, executive chef at Stone Cellar Restaurant (show to air on April 24), and Red Seal chef Henry Strong, 44, head pastry chef at Hilton Garden Inn of Ottawa (show appears June 12). “I had no idea of the outcome – really,” said chef Peter Robblee, Aitken’s business partner at Juniper restaurant. “I’m very proud of my friend. Am I surprised? Not really. “Norm is good under pressure and he’s a phenomenal chef. I would have been more surprised had be not won,” Robblee said. 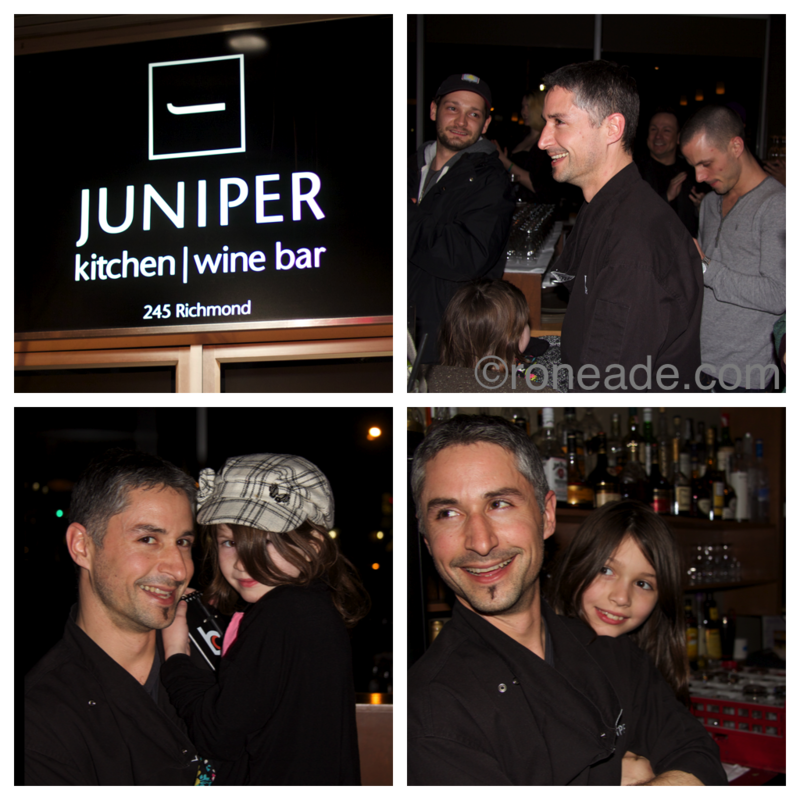 About 50 friends, family and well-wishers gathered at Juniper Kitchen & Wine Bar last night to watch Juniper chef/owner Norm Aitken win the top $10,000 prize in the first episode of season two of the popular reality TV series, Chopped Canada. What follows in my question-and-answer interview with Ottawa’s latest TV celebrity chef. Ron Eade: Tell us, how did you get on the TV show? Chef Norm Aitken: Chef Michael Smith, who I worked for at Inn of Bay Fortune in the 1990s before attending the Culinary Institute of Canada in Charlottetown, sent out a Facebook post last winter, about January or February 2013, announcing a casting call for Food Network. Interesting. I looked into doing Top Chef Canada but I couldn’t set aside eight weeks for the production schedule and leave the restaurant and my two kids, I just can’t do that. 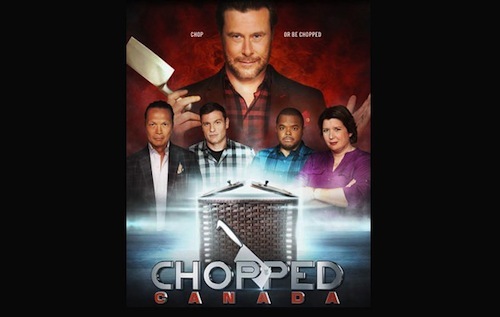 But Chopped Canada is a one-shot deal, taped in Toronto in one long 16-hour day. It’s not like a prolonged multi-week event and I said, hey, I can do that, no problem. You fly in the night before, that was last June, you do the shoot, then head back home that night. So, why not apply? 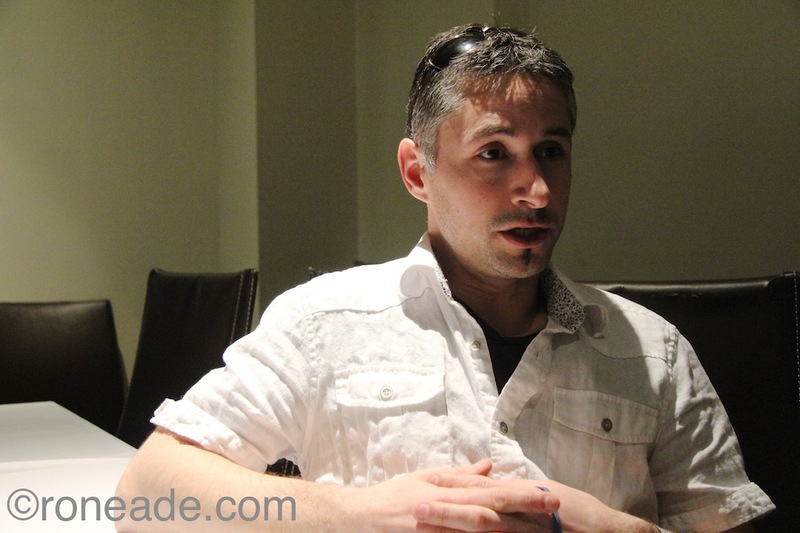 There was a lengthy process involved, with several interviews with producers on the phone. They’re after a Canadian feel to the show, so they’re trying to key in on the contestants and make sure they’re animated, dynamic. Then it was down to Montreal for another interview, this one on-camera when they throw you ingredients and say, quickly, what would you do with them? Now. On-camera. 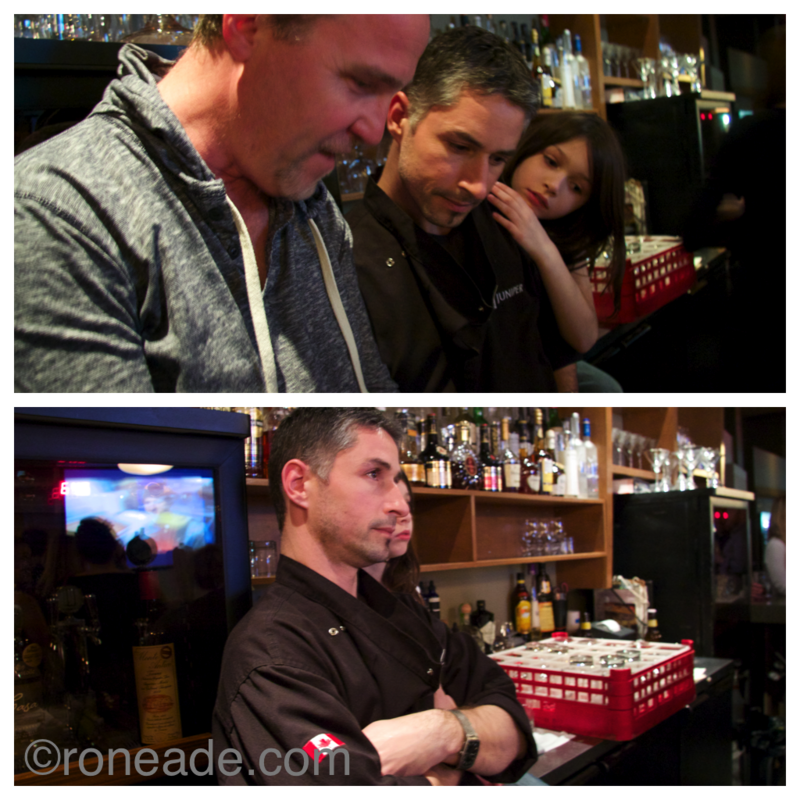 Bottom photos, chef Norm Aitken with daughters Erica, 7, at left, and Jade, 9, right. Ron: What appeals to you about doing the show? Norm: It’s the high pace, one shot, you’re on a timer, so that means you have to be creative — now. I love that. When we did a series of Duelling Chefs in 2010 and again in 2011, where we competed at Juniper as host restaurant against different chefs preparing dinners for charity, the whole point was to think on your toes. We loved it. Welcome to being a chef. This is the industry, it’s what keeps it alive for me, doing something different. Is it a draw to be on TV? I don’t know, I guess it is. I guess as a business owner trying to promote your brand then TV is a pretty good way to get your name out. Ron: You were sworn to secrecy until the episode airs on TV. Surely you must have whispered to someone, somewhere, at some time. Norm: I told no one, not even my daughters. All I said to them was, I can’t wait to see this on TV. That’s what I’ve been saying to everybody. I said I think I represented Ottawa well and I can’t wait to see it on TV. I have never seen the edited version. All I know is the 16 hours of gruelling competition I went through. Even my business partner, Peter Robblee, didn’t know the outcome. Ron: What did you expect going in? Norm: I expected high energy, a solid challenge. I was up against myself – it’s all up to you, with no team behind you. I’m like, oh man, I have no one else to blame. So I’m thinking, oh please, as long as I don’t get eliminated in the first round, that was my biggest concern. We had to do an appetizer, a main and a dessert, each using four mystery ingredients in a black box we saw for the first time, plus other ingredients we could select from a common pantry. That weighed heavily on me. I thought, god, I have a whole restaurant behind me with investors and business partners with all eyes on me. Now, that’s pressure. Ron: How did your expectations compare to the reality of the show? Norm: I didn’t expect what went on, not at all, from adrenalin to heart-racing to full-on sweat. I’ve never worked that hard, not ever. I’ve never moved that fast, seriously. It was very intense. Ron: For your first challenge, you were given dragon fruit, actually a type of cactus with a flavour that’s been described as a muted cross between kiwi and pear, even bland. What goes through your mind? What do you do with it? Norm: I’ve had dragon fruit in Taiwan, but it’s not the same as it is here. Here it has a tartness to it, but in Taiwan it’s sweet like candy. I’ve never really worked with it, other than as a garnish you throw on a cheese board for colour – bright red, white flesh with black spots. People use it for presentation. There was also thin-sliced donair meat [a Middle East dish of ground and spiced meat, packed tight, often served in a shawarma]. You look at the ingredients and wonder, how do I modify the ingredients, how do I change it, how do I make it good, how do I present it? I made soup with it, because I knew the other chefs didn’t know how to use it and they’re just going to make salads. I wanted to do something else, because I didn’t want four salads to go before the judges. I knew no one else was going to do a chilled soup. Easy. So I threw it all in a blender, and used deep-fried crumbled donair as a garnish with chopped herbs. Ron: So far so good, you survived the appetizer Round One. Next, what was your main dish? Norm: There was red mullet; I recall I was dealing with the tiny bones and I remember looking at the clock a few times and thinking, hey, I can’t be messing around with these bones any more, I have to move on. I butchered the whole fish into fillets, encrusted them in salt, seared them in a pan on the stovetop because using an oven would have involved extra movements. We were also given cheese curds, which I combined with milk and threw on the grill to melt into the milk. I added a few eggs, flour, and deep-fried them as fritters. Good. We were also given a jar of dulce de leche, like a caramelized syrup, and fennel. So I presented fennel salad on the side with citrus-herb vinaigrette, and I mixed the syrup with white balsamic vinegar to balance out the sweetness, which became my sauce. You only have half an hour. Norm: Dessert ingredients were beer, lime jelly powder, pretzel bread, and a bag of frozen mixed berries. So I made bread pudding with the pretzel. I put the beer, frozen berries and jelly powder into the blender, hoping to create a gelled sheet I could cut and place on the plate with bread pudding on top — but that didn’t work because it wouldn’t set, even using the blast chiller. Even though it was frozen, it would just fall apart, so I scooped it and plated it as a sorbet. Ron: How did the judges respond to your food? Norm: Know what? I really had no idea because I was secluded in a safe room while they deliberated, so you don’t see any of their commentary. All you do is cook, you stand in a line, there’s about 10 cameras that scoot around you, and then you’re gone. You could be waiting a half hour for them to decide. In all, it was a 16-hour day. Between photo shoots and interviews, it’s a real process. And while you were able to briefly see what was stocked in the common pantry as staple ingredients like flour, vinegars, oils, eggs, root vegetables, herbs or whatever, the pantry items could – and did – change between courses. They always changed it up. Top L-R, chef Michael Blackie, Norm Aitken, with daughter Jade. 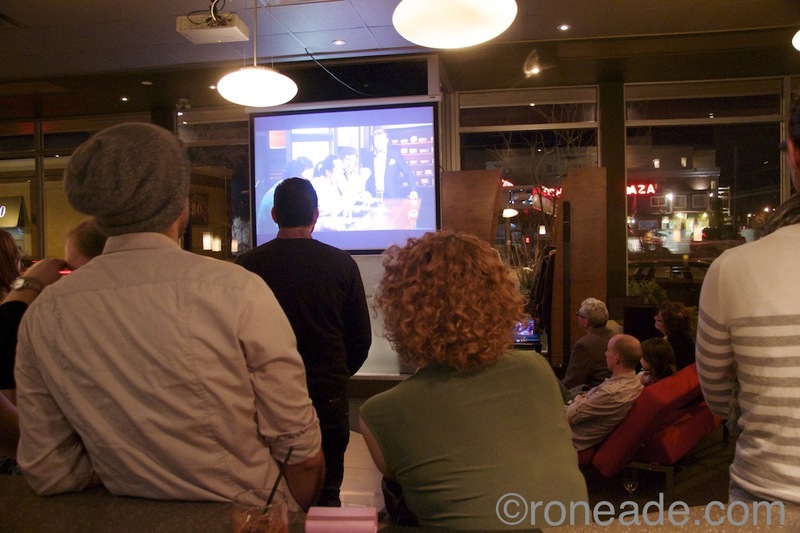 Bottom, Norm watches his performance on TV for the first time last night with friends and family at Juniper restaurant. Ron: What was your most challenging moment? Norm: Right off the bat, the first run. I didn’t know what to expect, I had no idea. As soon as they opened the first basket of ingredients I thought, holy crap, this is real now. The clock is ticking. I remember walking around the corner, seeing the judges for the first time. The only time there were not cameras on us was when we sequestered as chefs in the safe room. Ron: At what point did you feel you had it in the bag? Norm: In these competitions you just never know what’s going to happen, right up to the end. Even at dessert, I mean, what if my bread pudding isn’t cooked? Then I’d be out, done. You just keep going, expecting the unexpected. And that’s the whole point of the show, you just don’t know. Ron: Your judges included your mentor, TV celebrity chef Michael Smith, who was your boss years ago while you were an apprentice at The Inn At Bay Fortune in Prince Edward Island. Norm: When I walked around the corner and saw him I thought, holy crap. I was under him for eight years before I went to the Culinary Institute. The other judges were famous, too: Chefs Susur Lee of Toronto, and Vikram Vij from Vancouver. 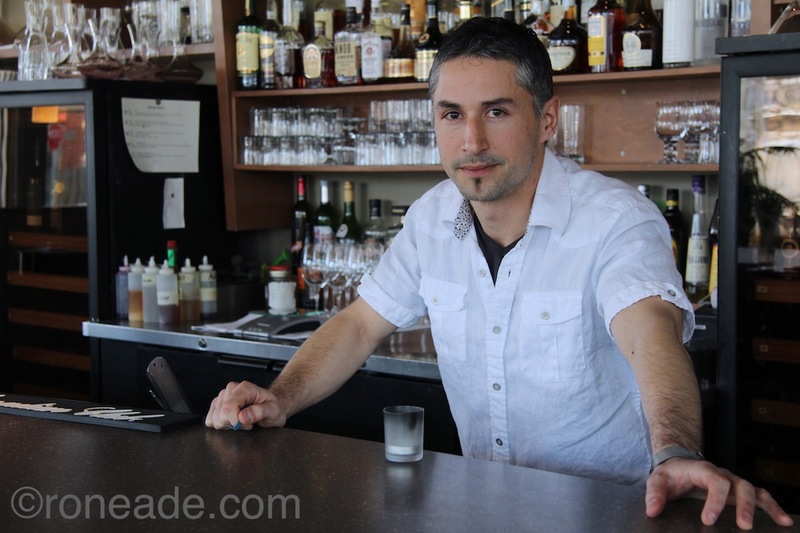 Michael Smith knew me years ago as a dishwasher, now there I was being judged as a chef. Ron: Have you received the $10,000 prize money yet? What did you do with it? 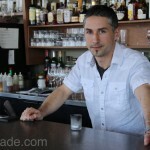 Ron: Any advice for other chefs going on the show? Norm: You’ve got to keep your eye on the prize. Stay focused. When I watch the show I see many chefs trying to do too much. Listen, when you’ve got 20 minutes you have to be realistic. Focus on the ingredients and just go flat-out.